Highlights of the Japanese collection include woodblock prints, Buddhist sculpture, sword furniture, netsuke and inrō, and lacquerware for both export and domestic markets. There has been Japanese material in the Ashmolean's collections from the earliest stages of the Museum's history. A pair of Japanese zori, described in an early inventory as ‘sandals made of twigs', was part of the original Tradescant collection; the foundation of the Ashmolean Museum given to the University of Oxford by Elias Ashmole. The Japanese collection is now best known for its ceramics, in particular the collection of seventeenth- and eighteenth-century export porcelain which is one of the most comprehensive collections in the world. Ceramics for the Japanese market are also well represented, including fine examples of Arita, Nabeshima and Hirado porcelain, tea ceremony wares and Kyoto earthenwares. The Museum holds paintings and screens from many of the major painting schools, especially the Nanga and Maruyama-Shijo Schools. 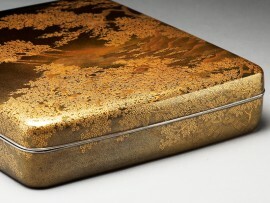 There is also an excellent collection of decorative arts of the Meiji period (1868-1912), including fine examples of cloisonné enamel, metalwork, porcelain and earthenware.